The New York State Department of Transportation moved quickly to repair a bridge in jeopardy, keeping traffic moving along a critical interstate for Western New York commerce. On January 5, the New York State Department of Transportation closed the Route 219 Bridge over Cattaraugus Creek after a routine inspection revealed structural concerns caused by frozen bridge bearings. Route 219 serves as one of the major highway connections between Buffalo and Interstate 86 in the Southern Tier, so NYSDOT knew it needed to complete the repairs quickly so that the roughly 2,500 daily users of the bridge could get to work easily and local businesses near the bridge would be affected as little as possible. "The department was able to expedite emergency repairs to the former Route 219 Bridge which provides a local transportation link between Erie and Cattaraugus counties," said acting Regional Director Darrell Kaminski in a written statement. "It was important to re-open the bridge to traffic because it not only serves local mobility and transportation needs, but it has a direct impact on the local economy of the surrounding communities." Shooting for an early April re-opening, NYSDOT got to work on removing and repairing the frozen load bearings for the 56-year-old bridge. The project gained support and cooperation from NYSDOT, local citizens and business owners, and elected officials at the state and local levels. 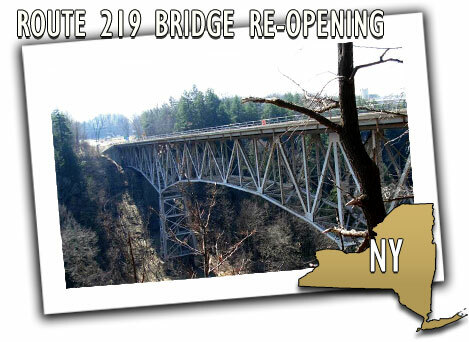 Due to this joint effort, the re-opening of the Route 219 Bridge was celebrated at a ribbon-cutting on March 23, weeks ahead of the April deadline. Some work is expected to continue on the bridge, though it is not expected to affect traffic. The repairs were completed under the statewide emergency bridge contract. More information on the project is available at bit.ly/nysdot219.